The costs of maintaining and upgrading the stadium would be taxpayer-funded in perpetuity. On Sunday, the eyes of the nation will fall on Atlanta’s brand-new Mercedes-Benz Stadium, site of the 53rd Superbowl. As players and spectators pour into the city, they’ll be dazzled by a state-of-the-art retractable roof and an enormous, wrap-around digital screen. What will be less apparent to thousands of spectators and millions of television viewers is a different kind of innovation—a carefully concealed legal clause that will privatize future profits of the publicly-funded stadium. The gnarled history of building professional sports stadiums with taxpayer funds has attracted some unwelcome attention in recent years, leading team owners and mayors to become more circumspect in how they publicize the millions they receive from cities in the name of economic development. Mayor Kasim Reed and franchise owner Arthur Blank extracted nearly a quarter billion in taxpayer funds to keep the team in town. Numerous studies demonstrate that promises of “economic development” around stadiums rarely materialize: Tax revenues don’t rise despite huge public investments, and per-capita income is actually damaged by the presence of a stadium. At best, dining and entertainment dollars are relocated from elsewhere in the city. Nevertheless, with threats of moving the franchise to Atlanta’s suburbs or even to Los Angeles, Mayor Kasim Reed and franchise owner Arthur Blank extracted the promise of nearly a quarter billion in taxpayer funds to keep the team in town. The billions in revenue the Falcons will generate in ticket sales and advertising won’t pay the city back for its malinvestment: The NFL franchise will pay neither rent nor property taxes. All the risks and costs of the stadium have been socialized, and its profits will be privatized. This is a frequent pattern of collusion between local government officials and developers. The Falcons’ general manager-turned-CEO, Rich McKay, extorted a new publicly-funded stadium from the people of Tampa before turning his sights on Atlanta. When originally announced, the stadium was slated to cost the city $200 million, with remaining costs borne by the Falcons and team owner Arthur Blank. No one should begrudge Blank his $4.6 billion net worth, which he earned as co-founder of The Home Depot, but we might reasonably expect him to finance his own pet project rather than fleecing ordinary Georgians already struggling to make ends meet. Proponents of the deal claimed that Atlanta’s residents wouldn’t be footing the bill since the public funds were coming from a hotel tax paid primarily by visitors. In the fine print of the stadium agreement, though, was a subtle clause that negated the cost cap altogether: All future funds from the hotel tax would be put into a revenue-sharing arrangement benefiting the stadium, the team, and its owner. The costs of maintaining and upgrading the stadium would be taxpayer-funded in perpetuity. So the city of Atlanta sunk nearly a quarter billion taxpayer dollars into a private, exclusive venue with ticket prices starting at $500 per seat. Blank will receive all ticket and concession revenue despite the stadium’s nominal classification as a city venue. 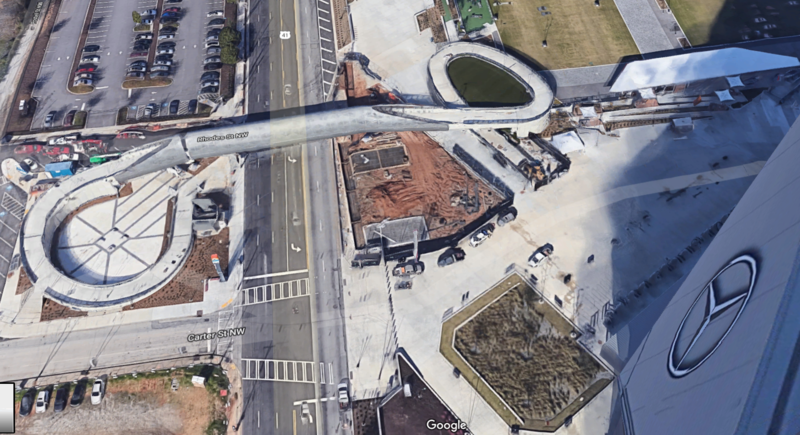 In addition to its portion of the stadium itself, Atlanta shelled out $30 million in sales tax breaks for construction, $24 million in land value, and a yet-underdetermined sum to build the elaborate snake-like bridge above the four-lane Northside Drive. The bridge’s budget ballooned from $12.8 million approved by Atlanta City Council to $23.3 million, including more than $6 million for customizable LED strip lighting. That the bridge was designed to match the angles of the stadium, rather than the character of the surrounding neighborhood, underscores the mayor’s disingenuousness. Earlier this month, local reporting revealed that bonds and sales taxes that were supposed to fund the city’s infrastructure projects, from sidewalks to road maintenance to crumbling civil rights landmarks, subsidized the bridge instead. Atlantans agreed to pay a surcharge to live in their own city, and politicians redirected that cash and its noble intentions into a pointless pet project. A press release from the mayor’s office claimed—ludicrously—that the bridge project wasn’t built for football fans or national broadcasts but instead as a service to historically under-resourced West Side neighborhoods. He predicted the bridge would save lives at street-level. But Mercedes-Benz stadium, like the Georgia Dome, the World Congress Center, and other planned development projects before it, have only further cut off the West Side from downtown, disrupting traffic and a once-robust streetcar line. That the bridge was designed to match the angles of the stadium, rather than with any consideration of the character of the surrounding neighborhood, underscores the mayor’s disingenuousness. To make matters worse, even the narrow “general public” who can afford a thousand-dollar ticket to the Big Game won’t be permitted to use the pedestrian bridge on Superbowl Sunday. Citing security concerns, the Mercedes-Benz venue announced days before the game that access to the “community’s” bridge will be restricted to Super Bowl staffers and credentialed journalists who have been pre-approved by stadium security. Atlantans at large will be on their own at street-level, risking the lives Mayor Reed claimed would be saved by the bridge project. When community investments are decided by a small group of distant elites, rather than by the people who live and work in the neighborhood, we should expect that the resulting development plans will misunderstand the needs of a community and reward the cronies of the powerful. 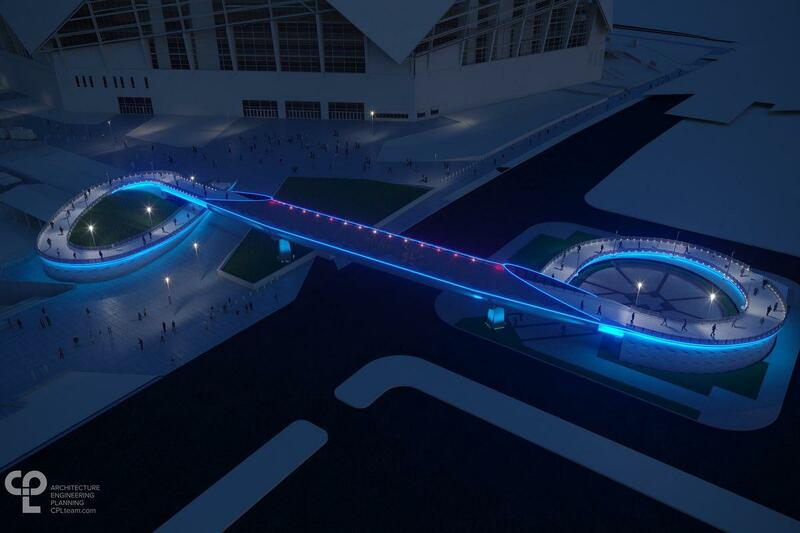 Atlanta’s mammoth stadium and serpentine walkway for the selected few, bespangled as they are with matching ‘custom LEDs,’ couldn’t be a clearer illustration. Legendary Atlanta Falcons owner Arthur Blank on Super Bowl LIII from CNBC.